WILLS POINT, Texas, Dec. 6, 2018 /Christian Newswire/ -- As holiday shopping in the United States is predicted to top $1 trillion this year, GFA (Gospel for Asia, www.gfa.org) is urging Christians in the West to make the season more Christ-centered by adding someone they don't know to their gift list. 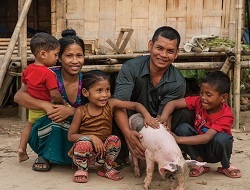 Photo: A family with a donated pig provided through GFA's Christmas gift catalog. They are just one of thousands of Asian families helped to break out of extreme poverty, which is the focus of GFA's "Forgotten Christmas" campaign. GFA's "Forgotten Christmas" campaign (www.forgottenchristmas.org) gives an opportunity to churches and individuals to provide practical gifts, including income-generating resources that can help lift a family out of poverty in Asia, where millions struggle to survive below the $1.90-a-day poverty line. The centerpiece of the effort is a touching three-minute video drama which follows a young American boy as he provides desperately needed groceries for a struggling couple in his neighborhood. "Christmas is about so much more than just gifts," viewers are told. "Let's bring Christmas back to what it's really meant to be about: giving hope to others. Why not go further than just next door? Make an impact around the world this Christmas." They can do that through GFA's Christmas Gift Catalog (www.gfa.org/gift), which features almost 40 different giving opportunities. GFA hopes that in this 12th year of "Forgotten Christmas," churches and individuals around the globe will join them in seeing families in Asia receive help to rise above the poverty line. Last year, GFA and its supporters helped more than 230,000 families receive income-generating gifts. One GFA supporter who provides help through the gift catalog each year said: "What a wonderful way to invest treasure into some of the poorest of the poor—a way that gives them new opportunities for self-support and dignity and demonstrates God's love for them."